I expected the compiler to issue an error, as the call is ambiguous between the two implementations, but it returned the first declared interface. because there is no ambiguity that the compiler can know about. GetName() is in fact a valid method on interface IGeneric<Base>. The compiler doesn't track the runtime time of b to know that there is a type in there which could cause an ambiguity. So it's left up to the runtime to decide what to do. The runtime could throw an exception, but the designers of the CLR apparently decided against that (which I personally think was a good decision). Once again, many consumers could call either CallIt or CallItOnDerived1 and be just fine. But our consumer passing DoubleDown also is making a perfectly legal call that could not cause a compiler error when they call CallItOnDerived1 as converting from DoubleDown to IGeneric<Derived1> should certainly be OK. Thus, there is no point at which the compiler can throw an error other than possibly on the definition of DoubleDown, but this would eliminate the possibility of doing something potentially useful with no workaround. Given that the chance of the language changing to support this is virtually zero, I think that the current behavior is alright, except that it should be laid out in the specifications so that all implementations of the CLR would be expected to behave the same way. You must have already realized that the result in reality, changes with the order you declaring the interfaces to implement. But I'd say that, it is just unspecified. If more than one member matches, it is unspecified which member is the implementation of I.M. This situation can only occur if S is a constructed type where the two members as declared in the generic type have different signatures, but the type arguments make their signatures identical. Q1: Do your generic interfaces have different signatures? A1: Yes. They are IGeneric<Derived2> and IGeneric<Derived1>. Q2: Could the statement IGeneric<Base> b=x; makes their signatures identical with type arguments? A2: No. You invoked the method through a generic covariant interface definition. Thus, your call is meet the unspecified condition. But how could this happen? Remember, whatever the interface you specified to reference the object of type DoubleDown, it always is a DoubleDown. That is, it always has these two GetName method. The interface you specify to reference it, in fact, performs contract selection. The images shown that, these two generic derived interfaces neither have the same name nor another signatures/tokens make them identical. And now, you just know why. The language specification does not clearly say what to do here. This scenario usually arises when someone is attempting to emulate interface covariance or contravariance; now that C# has interface variance we hope that less people will use this pattern. Most of the time "just pick one" is a reasonable behaviour. How the CLR actually chooses which implementation is used in an ambiguous covariant conversion is implementation-defined. Basically, it scans the metadata tables and picks the first match, and C# happens to emit the tables in source code order. You can't rely on this behaviour though; either can change without notice. The question asked, "Why doesn't this produce a compiler warning?". In VB, it does(I implemented it). In VB, if you declare a class C which implements both IEnumerable(Of Fish) and IEnumerable(Of Dog), then it gives a warning saying that the two will conflict in the common case IEnumerable(Of Animal). This is enough to stamp out variance-ambiguity from code that's written entirely in VB. However, it doesn't help if the problem class was declared in C#. Also note that it's completely reasonable to declare such a class if no one invokes a problematic member on it. 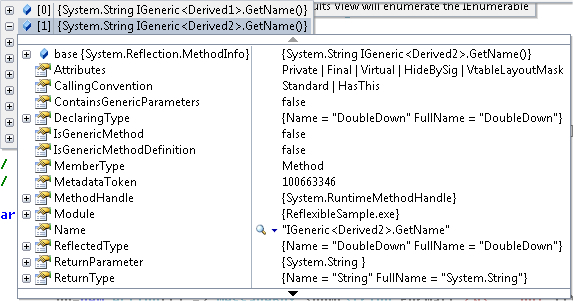 In VB, if you perform a cast from such a class C into IEnumerable(Of Animal), then it gives a warning on the cast. This is enough to stamp out variance-ambiguity even if you imported the problem class from metadata. However, it's a poor warning location because it's not actionable: you can't go and change the cast. The only actionable warning to people would be to go back and change the class definition. Also note that it's completely reasonable to perform such a cast if no one invokes a problematic member on it. How come VB emits these warnings but C# doesn't? When I put them into VB, I was enthusiastic about formal computer science, and had only been writing compilers for a couple of years, and I had the time and enthusiasm to code them up. Eric Lippert was doing them in C#. He had the wisdom and maturity to see that coding up such warnings in the compiler would take a lot of time that could be better spent elsewhere, and was sufficiently complex that it carried high risk. Indeed the VB compilers had bugs in these very warnings that were only fixed in VS2012. How does the CLR resolve the ambiguity when chosing which one to invoke? It bases it on the lexical ordering of inheritance statements in the original source code, i.e. the lexical order in which you declared that C implements IEnumerable(Of Fish) and IEnumerable(Of Dog). Trying to delve into the "C# language specifications", it looks that the behaviour is not specified (if I did not get lost in my way). • If the compile-time type of E is an interface, the function member to invoke is the implementation of M provided by the run-time type of the instance referenced by E. This function member is determined by applying the interface mapping rules (§13.4.4) to determine the implementation of M provided by the run-time type of the instance referenced by E.
• If S contains a declaration of an explicit interface member implementation that matches I and M, then this member is the implementation of I.M. • Otherwise, if S contains a declaration of a non-static public member that matches M, then this member is the implementation of I.M. If more than one member matches, it is unspecified which member is the implementation of I.M. This situation can only occur if S is a constructed type where the two members as declared in the generic type have different signatures, but the type arguments make their signatures identical. Not the answer you're looking for? 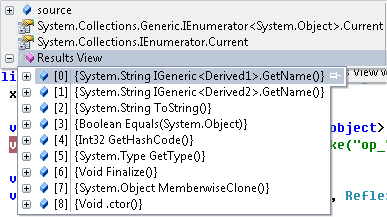 Browse other questions tagged c# generics types interface covariance or ask your own question. Why is a property get considered ambiguous, when the other interface is set-only? How do I add multiple objects to a single array? A class implementing two different IObservables?